Now, I am sure you are asking, "What's with the post name, Domino? 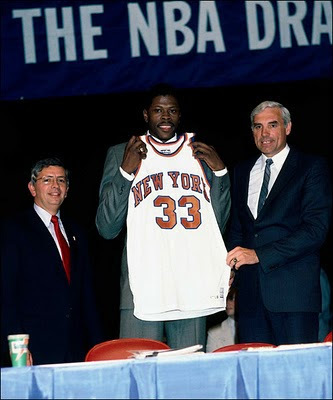 And what does it have anything to do with Patrick Ewing and a young-looking, handsome David Stern?" Well, Little Puddler, I can explain everything to you and very simply. The name of this post derives itself from the internet connection that we use here at the Puddles of Myself headquarters. When this internet connection is working smoothly, I can post as many times as I want to and right on the schedule I like to keep for the blog. However, this week Linksys2 has been giving me some problems so that is why your Tuesday podcast was delayed and also why there was no post on Monday. The name Linksys2 also works because this is the kind of post I like to do every so often when I round up some links and other random things to point you to so that you can read and etc. Oh, and the Patrick Ewing picture I just think is funny and is also timely because last night the NBA Draft Lottery took place, which is always a great spectacle to watch. In somewhat a shocking turn of events, the Washington Wizards will have the number one pick in the NBA Draft on June 24, 2010 where they will most likely pick John Wall who they hope can turn around their franchise after the unfortunate circumstances surrounding Gilbert Arenas and his gun-toting ways. It is yet to be determined if the Wizards will find a way to release Gilbert Arenas from the team, but I know already that the pre-gun incident Arenas would not be humble enough to share the ball with a natural point guard like John Wall. We'll see how this plays out as the draft has really only two sure bets (John Wall and Evan Turner), two players with significant potential but serious questions (Derrick Favors and Demarcus Cousins), and a lot of marginal talent that won't necessarily add a ton to each team, but if picked by the right team can really help to bolster some lineups around the league and fill in the cracks. This is more of a glue draft than a real substantive draft. Now, to some links. - Sticking with the NBA, Bill Simmons delivered two great columns last week. The first was a game diary of Game 5 between the Cavaliers and the Celtics, while the second was a breakdown of the future for LeBron after Cleveland lost the Eastern Conference Semifinals to the Celtics. I read this after my own post on LeBron and the lead up to his pending free agency. As always, Simmons does a terrific job. - Also last Friday, Simmons did a podcast with Carlton Cuse who is one of the creators of Lost. If you have followed the show at all it is a very interesting listen. I watched parts of last night's episode and am definitely going to watch the two and a half hour series finale next week. I think I'm going to go to the Bell House and watch it. Maybe dress up like Sawyer or Sayid. - Speaking of TV. I am definitely getting anxious for Season 4 of Mad Men to start. The season is scheduled to begin on July 25, 2010 and there is a little bit of info about some unclear items that may take place in the fourth season. 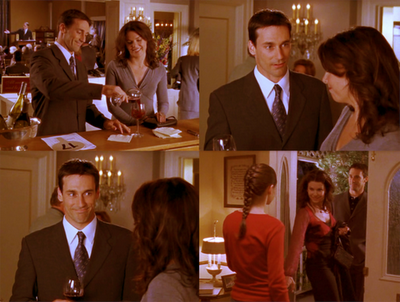 - While we are on the subject of Mad Men, check out this picture of a young Don Draper (Jon Hamm) playing Lorelai Gilmore's boyfriend on an old school episode. He was already developing some classic Draper faces. - I forgot on the earlier post today to provide a link to the Darlings' material so that you can just it out when you are not listening to the podcast with Joe Tirabassi. You can also check out pictures and other items of the band here. - I also forgot to mention last week that my friend Janelle Sing, who has done her own podcast as well as the Gilmore Girls podcast, has a new blog up, Giovanni and Giotto, in addition to her website. The blog features more blog type of material and musings as well as pictures of some of the new items she is designing, which include shoes, handbags, and wallets. Stay on top of her blog as it will be a good way for you to purchase some of these products at the ground level before she blows up big time. - In other blog related news, I wanted to give a shout out to the blog of Ally Jane Grossan, which is called Kitchen Princess. Ally Jane and I used to work together at Salmagundi Magazine when I was a senior at Skidmore and she was a freshman. Since I left Skidmore, Ally Jane took over the reigns of a lot of the operational stuff going on at the magazine. I always thought that she had a strictly literary writing interest, however, it turns out she has been keeping a terrific food blog at Kitchen Princess that I recommend anyone should read and keep up with. - My friend Luna Malachowski Bajak of the blog Postres de Abuela y Torres de Caramelo, has had another blog that she updates, which features her artwork. Please check it out here. - A final blog I need to mention is the blog of my friend Cyrus Lubin. Mr. Lubin has created a dog blog, which has some great pictures, but in my opinion, features some fantastic captions. - The upcoming podcasts that will be appearing on this blog will include the following guests: Chris Dannen (writer) on writing and other related topics; Cyrus Lubin (drummer, label head, promoter, organizer extraordinare) on his own band, promoting shows, and the Famous Class label; Lauren Gidwitz (artist) on her art, painting and other items that we come up with on the spot; and Paul Sicilian on the NBA Playoffs overall, the Tony Castles and the success of the Boston Celtics. A lot of good stuff I promise you. - Some future podcast ideas that I have coming up will be a podcast with David Stern devoted to the baseball movies, Major League, Major League 2, Little Big League, Rookie of the Year and Mr. Baseball; a podcast with Erik Gundel about the movie Teen Wolf; and Gilmore Girls Podcast Part 2 adding Ally Jane Grossan as a possible Gilmore Pundit. I've been getting a lot of responses about that podcast and we may need a whole panel for that one. May even need to change the title of this blog. - Speaking of Teen Wolf, please look at this video. It is probably the funniest thing of all time. - Finally, in a bit of personal news and news related to this blog, I will be starting a new job at W Magazine next week. I will continue to update the blog as I have been over the past two months but you can usually expect to find posts on the blog in the evening from now on. Alright, my Puddlers, there are always good things coming on this blog. Just stick with me and I will take you there.